RMS Titanic was found about seven years before I began my research into the ship. During those intervening years I remember seeing photographs, photograph mosaics, and drawings based on photographs of the wreck, with an analysis of what caused the damage we were being shown. Two of the conclusions that were often repeated I never agreed with (and that was before I began my research). First, the collapsed decks on the bow section did not happen when the ship hit the ocean bottom, as is commonly believed. The animations always show completely erect decks that collapse on contact with the ocean floor. Granted, when the ship hit the bottom, more of the decks did collapse, but the decks at the break were already collapsed when the bow began its decent to the ocean floor. I did not know how or why the decks were collapsed at the break. What I did know was that if all of that damage was created when the ship struck the ocean floor there would be more damage than we were now seeing. 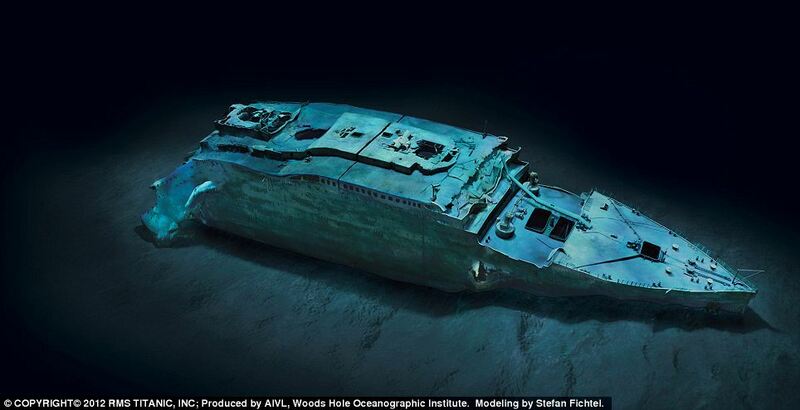 The bow of Titanic forward of the anchor struck the ocean floor first. The ship hit the bottom with such force that it buried the nose of Titanic deep into the mud. The energy created from Titanic’s decent to the bottom, coupled with the weight of the bow section, was so powerful that it bent the Titanic’s bow slightly to the right and from about the well deck back, the bow section was bent down. That was an incredible amount of energy. However, most of this energy was dissipated by the time the broken end of the bow hit the bottom. The energy left was just enough to collapse a few more yards of decks. The second conclusion I have never agreed with, is that water flowing through the stern is the cause for the massive damage to the stern. If this were true there would be more damage to the bow. As a submariner, I knew what caused the damage to the stern. Dr. Ballard described the stern as looking as if a bomb had gone off in it. One piece of metal bent outward and a piece of metal next to it bent inward. He said it made no sense. I recognized that description; it is what I hoped would mercifully happen to me if my submarine were headed to the bottom. Only one thing causes that kind of damage, an implosion. In 1992 I began to research Titanic in earnest. Fifteen years later I had discovered plenty about the Titanic, most there for the world to see, but overlooked by others. Still I could not explain the damage to the bow, but knew the leading theories were not correct. In 2009, I sat on the couch, quietly reading on a Sunday afternoon. I had just bought Brad Matsen’s “Titanic’s Last Secrets.” By the time I finished reading Brad’s book, I knew exactly what had happened and why. I finished reading his book at my desk and then immediately set to work. Grabbing my engineering books off the shelf and the folder with my notes on Titanic’s steel hull, I began to work out the math. I was mad at myself, I could not understand how I had missed this before. The missing pieces of Titanic’s double bottom and the conclusions of the Roger Long were the missing key I had been looking for; the Roger and the other Titanic experts were so close, but their conclusions missed one important fact. I now knew what had happened to Titanic, why the experts and Roger were still getting it wrong, and more important why Titanic broke up and sank the way she did. As the stern began to rise into the air the double bottom could not support the weight. The hull that was in water was at the freezing point. That temperature was the temperature at which the steel was at its weakest. But, the decks inside Titanic were not at that temperature. The Titanic, inside its hull, was at a comfortable temperature and in the engine room it was down right hot because of the boilers. The decks inside Titanic would be more pliable because of the warmer temperature, whereas the exterior hull would be brittle and fracture. This is the point that Brad’s scientists, and the titanic experts, keep missing the decks inside Titanic’s hull would not and did not fracture when the hull fractured. When the hull had fractured, as the stern reached 11 degrees up, the decks inside did not. The decks inside Titanic stretched, bent, and collapsed down on top of each other. The weight of the Titanic was being supported by the walls and bulkheads inside Titanic, they were not made to support this kind of weight. What Brad Matsen’s scientist had missed was the warmer temperature of the decks inside Titanic. The walls and bulkheads inside Titanic, directly above the now missing section of double bottom collapsed under the weight of Titanic’s stern, folding up like cardboard. The decks pan-caked down after the walls and bulkheads collapsed. When this happened the bow took a plunge downward and slowly began to point vertically down. This is when the stern settled back and then rose vertically. As the bow began to attempt its decent to the ocean floor, the stern (still filled with air) pivoted upward with the collapsed decks acting as a hinge. The decks had been bent in one direction as the stern settled back and now as the stern rose vertically those same decks were being bent in the opposite direction. The air trapped in the stern held the stern above water until enough air escaped to allow the water-filled bow to pull the stern underwater. If the two sections had broken at the surface, the air trapped in the stern would have caused the stern to float longer. Also, without the bow tugging on the stern there was too much weight with propellers, propeller shafts, rudders and steam steering equipment to allow the stern to stand up on the broken end. If the ship broke into separate pieces just below the surface, the air-filled stern end would have floated back towards the surface before starting its decent. The damage from the implosion of the stern shows there was still quite a large amount of air in the stern when it imploded. The bow must have pulled the stern deep enough to overcome the positive buoyancy of the air trapped inside, and then the hull separated into two separate sections. The stern separate from the bow, at a point still within a few hundred feet of the surface, the pressure from the sea overcame the weakened steel and much lower pressure of air trapped inside and the stern imploded. When the bow struck the bottom, the already weakened bulkheads inside Titanic collapsed and more of the bow decks pan-caked down, towards the forward end of the bow. The section between the bow and stern was shredded by the negative buoyancy of the bow and the positive buoyancy of the stern working against each other, and the twisting of the hull which was happening just before separation. The scientists were correct when they said the hull could only support the stern to an elevation of eleven degrees. They said the ship separated in two, only because they forgot about the warmer temperature inside Titanic. The scientists were concentrated on the remarkable discovery of the double bottom pieces they had just found, and over looked the warmer internal decks of Titanic. 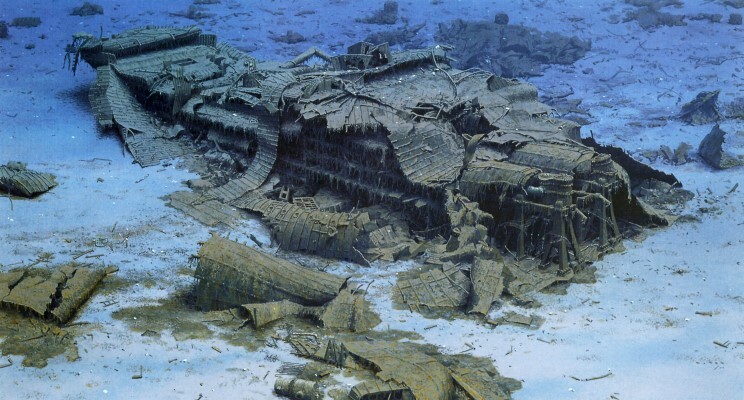 Looking at the remains of the USS Thresher reminds us of the stern of the Titanic. Looking at the remains of the USS Scorpion reminds us of the bow of the Titanic. The USS Thresher imploded and the USS Scorpion was water-filled as it descended to the ocean floor. 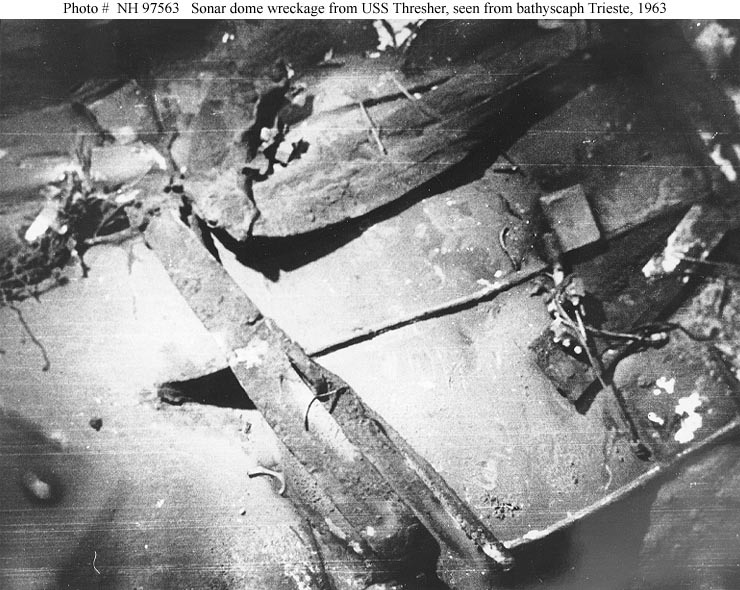 Difficult to recognize wreckage of the USS Thresher. 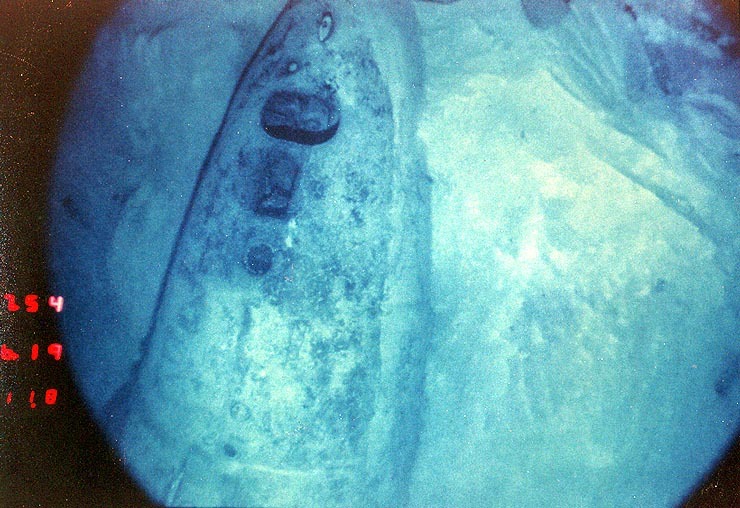 The bow of USS Scorpion, looking as it did on the surface. The bow of the RMS Titanic, very recognizable. Joe, I think you are much closer then the experts but I feel you’re giving too much credit for the decks. The internal deck we’re not attached with the same rigidity as the strength deck. Did you look at the plow there is a severe bulge in the bottom half. I think the bow tells more of a story then anyone is giving credit for. I am not an engineer but from all the recent reading I have done including yours along with Park Stevenson James Cameron and others, I feel too much credit is being put on the condition of the bow as Landing damage. While I agree that’s a break and the forward band of the bowel section was due to the sliding impact into the ground at an angle, I do not agree that the bumps along the side of the bow near the break section are part of impact damage. I suspect that the Titanic did not hit the bottom with as much force as people think once the Bow dug in and took the pivot downwards. That is forward energy and when that was dissipated the extreme pressure of water at two and a half miles down below surface allowed the rest of the hall to gently settle down into the ground hence no crater. I think that you and the experts should reevaluate the I’ll work turn of the Bulge at the break. I think that is more evidence of how the Titanic truly broke up and it works perfectly with the testimony of the survivors indicated that the shift did not have a severe drop in the forward section but we’re more concerned about a port side roll over. I don’t think the Titanic’s props ever got out of the water until the very end and that would have been after the break right before she went down. That would also explain why only a few of the survivors observe the Titanic breaking whereas more of the others never saw it. Another issue I have is that when people read the words break they think of broken as if there was a definitive separation what in fact break just means that something broke but it doesn’t mean that it is completely separated. My evidence for that is when I was a child I broke my father’s axe handle but I did not break it and have it only broke structurally meaning you could send the handle back and try to make it look like it was not truly broken. You mentioned heat as why the decks didn’t separate but that the hall was cold so it broke. If the whole world then people would have noticed and all of the survivors who watch the ship go down would have made mention of a break. I postulate that the heat was much greater amidships then in the bow, especially where the break occurred between the engine room and the number one Boiler Room. Both of those areas are going to be extremely hot and that’s not just going to affect the decks above, but also the hull of the ship. I believe that the whole was warm enough to allow the steel to bend and Wrinkle and twist which evidence points to just by looking at the composite pictures of both ends of the wreck. I believe that if we take all of the evidence that has been gathered by you and the other researchers we can definitively put together how the Titanic broke with your hypothesis taking the lead. The only two virgins I have with your hypothesis is the hull. I think the hull managed to stay together until the entire ship was well under water and once the ice cold ocean had cooled the steel that’s when the actual separation happens. Think about the Titanic as a Bendy straw in which the Bendy part of the straw is the middle of the ship between the Third and forth photos and the second and third funnels. That would explain the missing Tower, the multiple keel sections that were found and it would also help to prove the bottom up break theory. Titanic broke while still relatively flat in the water. I would postulate that the ship only had a 4 to 5 degree downward projection into the water. There is also evidence of a separation in the side of the ship bye Boiler Room number 3 which means the Titanic suffered more damage then even Edward Wilding could have predicted. Wild Titanic was Sinking by the head the entire hull was being dragged underwater and it was also reported that port holes along E deck were left open which means water was flooding almost the entire length of the first half of the ship which explains why the passengers did not notice much of a forward dip what did remark of a list to port. That list along with the slight downward pulll of the bow is what caused the structural failure of the Keel at frame 25. Once the keel bent in on itself, it allowed water to fill the the center of the ship does cutting out the boilers once and for all. That also allowed the rear of the ship to bend upwards and the bow to lift up as well because of the sudden change in flooding as observed by Jack Thayer. The hull and the decks acted in tandem to keep the ship together as the bell went under and gave the stern its final lift into the air to be pulled under the water as you postulated. In fact it was probably the implosion that’s finally separated the ship and also allowed for the Yen’s section which was centered around the third funnel update and support structure to be launched away along with the skin of the stern and those two pieces of keel plating. I think you should revisit the break up one more time and utilize the passenger’s observations of the sinkingbas given in testimony during the American inquiry and rebuild The Break-Up based upon that. According to survivors testimony everyone remain calm on the ship except for the last 15 minutes which means thoes in the boats were calm as well. I would take the officers testimony with a grain of salt because they we’re representing the company and were informed of what would be at stake if they told exactly what they saw so I feel they lied. Very well written. Thank you and thank you for the time you put in to writing this. I agree with each point you made. The only big difference I see in our versions is I think when the ship did separate into to two halves it was pointing straight down after leaving the surface and headed to the bottom. There was probably still some air in the stern section which would have accounted for the attitude of the ship when the separation came. Just found this today. Fascinating. Almost exactly the way I described it in “Unsinkable” back in 1998. Daniel your work “Unsinkable” is it a article or book? Do you have a web site? Please post a link, I know my readers would like to visit your web site. I have an article I’ll be posting in April about the break-up of Titanic that you may find interesting too. Thank you Daniel and have a great day. My Titanic website can be found at http://www.rmstitanicremembered.com. Thank you Daniel, I appreciate it and I know my readers will too. 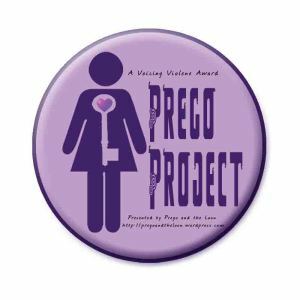 If you would like to write a guest article for my site, you are most welcome. ALSO, if you are making an appearances or have a new book coming out, let me know and I will get the word out. I may have an article for your site. We can discuss it in private email. I will be happy to post any information about upcoming appearances–thank you for that opportunity. I’m looking forward to your Morro Castle article(s) with great anticipation! Sorry I meant March 29th! Ugh! I’ve decided to do the guest post on the discovery of the wreck. Also the Morro Castle post will be up on the 23rd. I looked at the calender wrong! Enjoyed the post. I am looking forward to the Morro Castle article. If you are looking for any particular information on the Titanic article let me know. I’ll search my library. I have Dr. Ballards memior, it’s very good (just wish he would have indexed it LOL). I think you picked the perfect topic, don’t forget to link to it on your page after it is posted. Will do. I’m reading through The Discovery of the Titanic by Ballard, right now. But if I need anything I’ll be sure to contact you. Thanks again.